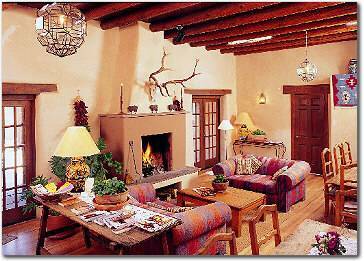 Walking into Hacienda Nicholas is like stepping back in time. 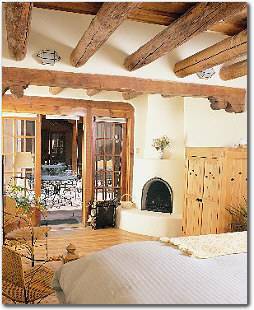 The old adobe home in the heart of Santa Fe features a central "great room" with 20-foot ceilings, thick wooden vigas, softly colored hand-troweled plaster walls and a fireplace large enough to cook in. Isabella's garden, filled with roses, wisteria, iris, daisies, pansies and geraniums, provides an ideal setting for leisurely breakfasts or afternoon tea. In warmer weather, birds sing in the trees as sunlight filters through the leaves. The outdoor kiva fireplace takes the chill out of the air on cooler days. 1) If I cancel up until 2 weeks before my scheduled arrival, I will receive a credit to my card for the deposit amount minus a $20 cancellation fee. 2) In the last two weeks before my scheduled arrival, if I cancel, I will receive the refund listed above only if you are able to re-book the room for all of the nights I am scheduled, or the deposit is forfeit. 3) Once I arrive at the Inn I am financially responsible for my entire stay, even though I may choose an early departure. If you are able to re-book any of the days should I depart early, I will receive the same refund listed above, assuming I have paid in full at check in. The Inns are not responsible for cancellations due to inclement weather.